Tomorrow is last day of school. Now that I pretty much finished I'll give my thoughts about TDDS. First I think they have some really great instructors. I don't have any doubts I'll get my CDL on my 1st try. TDDS us close to my home so that was a big factor in chosing them. We have a few guys who stay in the dorms the school provides but none of them have anything good to say about them. I haven't seen them myself. The school itself is pretty run down and the restrooms seemed to always smell pretty bad. So I would say the facilities have alot that could be improved. To me that's not a big thing but someone who has to stay at the school might want to think about it. Now the equipment we trained on was pretty run down. I understand that students will be hard on equipment and never expected really nice equipment but I think it could have been better for the money everyone pays to go there. The lot we did manuevers in was a mess, nothing but mud and big pot holes. Again this isn't a major thing but I ended up ruining two pairs of shoes from getting out to look and stepping in ankle deep holes. Now that we're finished they are doing renovations of the lot. Go figure. Anyway, I payed to learn to get my CDL and I will do that. Schneider allows zero pets, zero weapons unless it's a hammer or tire club. A knife that is smaller then 4" is permissible. You may get home the weekend before you leave, but my buddy went out Saturday solo after graduating Friday. You don't get paid 80. 7 days for 3 weeks. The first week is Wed-Saturday. The second weeks is Sunday- Saturday and the third week is Sunday till you graduate which could be Thursday or Friday. They do have computers you can use for the computer training modules. It is a great place, and most people are really friendly. They expect you to work hard and show respect and they will show you respect too. They treat you as equals, and there is really no sonority stuff there. The Atlas agility test is easy as long as you have no heart issues. Your not going to be tested on the slow manevour course, but it is a lot of fun!!!! I was told different about the training pay. I asked if payed for everyday there and they told me yes you are. Good luck with Schneinder. I am starting a trucking school in the beginning of December and Schneider is on my short list of potential employers. They are big enough to offer many driving options, seem to welcome rookies and are have about the pet-friendliest policy I have come across. I'll be interested to hear about your experience there. I hope you keep posting, or better yet start a blog! Not sure where you saw Schneider allows pets, from everything I read on their site they do not..I wish they did. I know Roehl just started allowing pets and USA Truck will in Jan 2016. I start CDL school in January and hope to take my little buddy with me later on. My recruiter specificly told me no pets or weapons on the truck. You might want to look into that more. Thanks everyone. My fiance understands, she was actually pushing me a long time ago to go regional and to go with Schneider. Ended up getting what she wanted lol. Also am glad to hear good things about Schneider. I have heard the training is good though. How does there training time go? Is it straight through the week and weekends? I would assume it is. Hey everyone. I am just excited to finally start my new career. 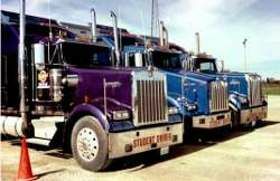 I graduated school in the beginning of October and got my CDL A. I tried and tried to get a local position but it is not easy with no experience lol. So I finally decided to go regional and after looking at all sorts of companies I chose Schneider. I hear good things about there training and it is not that long as long as I do not need more time. I have my 2 year old daughter, and being away will be hard. But I will get through it so I can get some experience. I am probably going to get in my one year and try again for local. Other than that I am set to go for orientation on December 8th. Wish me luck. I'm also set to start orientation Dec 8th. I got one day of school left and test on Saturday for my CDL. Are you training in Indianapolis ? 1st week of Schneider training finished! Are you still with Schneider ? I do my 2nd phone interview this coming Wednesday. I finish school the day before Thanksgiving and am hoping to be going to training the beginning of December in Indy. Well today was first day of driving on the road. They have a loop that takes about 30 minutes to run around. My first time was a little sketchy, missed gears and kept screwing up the downshifting. Second time around we all did alot better. Really think I'm going to enjoy this job. Half way through my training at TDDS. We finished classroom work last week averaged 98% out of 15 tests. Monday we start manuevers, actually straight line backing is whats scheduled for tomorrow. The instructors have been great, the equipment in the yard is kinda ragged but can't expect nice stuff either with students operating it. Still haven't got a company locked down yet. Torn between Schneider and what I hear of their training or going the LTL route with YRC. And something in the back of my head keeps nagging me to think about flabedding. Lol. I have been talking to both and was wondering if anyone had any opinions on either. Schneider is possibly a dedicated Walmart run out of Wintersville OH. YRC is Road Driver out of Akron OH. Thanks and stay safe out there. First two weeks are finished. So far I'm averaging a 96% at the top of the class. We got to go out one day and do coupling and uncoupling and work on the pre-trip. Now that I have my permit the pre-trip is my main focus. The instructor has been great so far. Get recruiters in almost everyday, which gets annoying at times but its part of it. Really enjoying it so far. I am also interested in this. I am still in school but YRC has been in contact with me. I have family that work for Con-way LTL and they're happy with them. Good luck and stay safe. Passed the combination endorsement today. Got my permit with all the endorsements now. Just got to get the DOT health card and background check for Hazmat. Good ;luck on your CDL test! If you have been using the High Road system, you'll ace it. And pre-hires go a long way to settle your future!